Q.E.D. Environmental Systems, Inc., a leading manufacturer of innovative environmental products and subsidiary of Graco Inc., announces its new TopDrive Piston Pump system for landfills and other cleanup applications, featuring a versatile, easily modified drive assembly for pumping in a variety of situations. 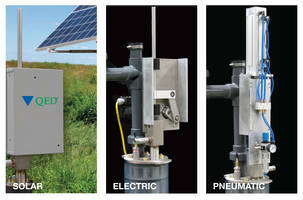 The TopDrive Piston Pump system is QED’s most flexible option for landfill and cleanup applications. Its fully-interchangeable drive assembly allows for easy transitions between hand, solar, electric and top-drive pneumatic pumping without removing the well seal. This feature provides additional flexibility in pumping applications and the ability to pump most fluids under a wide range of operating conditions. The TopDrive Piston Pump can be paired with QED’s patented well seals, which provide unsurpassed rigidity and feature customizable port options to meet site-specific needs. Other thoughtful design elements of the TopDrive Piston Pump include an interchangeable lower pump, which allows an upgrade to a higher flow rate and an adjustable drop assembly with 5 or 10-foot lengths, optimizing pump inlet depth. The pneumatic drive assembly features a linear bearing in addition to the internal pneumatic drive cylinder bearing, which is designed to increase the durability and life span of the pump. Finally, the TopDrive Piston Pump system includes a fully-customizable control panel designed to meet each customer’s needs. For more information, visit www.qedenv.com. Q.E.D. Environmental Systems, a subsidiary of Graco Inc., is a leading manufacturer of innovative environmental pumping systems, landfill products, landfill gas products, and air strippers for use at landfills, mines, oil refineries and other industrial sites, as well as hazardous waste cleanup sites. Our products are used around the world for a wide range of environmental applications, including groundwater sampling, groundwater remediation pumping, landfill leachate and condensate pumping, landfill gas collection and control, landfill and biogas analysis, air stripping and VOC removal, and wireless data acquisition. Based in Dexter, MI, QED serves customers from support centers in Michigan and California. For more information, call 734-995-2547 or contact us at info@qedenv.com.